"ST. LOUIS, Missouri—Boeing has chosen Rolls-Royce to make the engine for its MQ-25 offering in the three-way competition to become the U.S. Navy’s Stingray, an unmanned, carrier-based tanker aircraft. Boeing’s MQ-25 Program Director Don “B.D.” Gaddis says its “T-1” flying prototype is as an advantage in its quest to prevail in the hunt for the fixed-price contract to develop and produce four aircraft. Boeing’s two competitors, General Atomics Aeronautical Systems and Lockheed Martin, are operating with design concepts. Seems ODDly familiar - Does Ma Hook Look BIG in this? BOING! Stealfy Hook - Going DOWN screenshot (not in 1st video). Youse may have forgotten that a STINGray killed STEVE IRWIN on Oz Barrier Reef some years back - they can be NASTY! "Why did Lockheed not build an MQ-25 prototype? NATIONAL HARBOR, Md. — Lockheed Martin’s unmanned MQ-25 tanker drone proposal for the Navy will incorporate some familiar equipment, including the General Electric F404 turbofan engine that powers the Super Hornet and the F-35C landing gear made by United Technologies Corp., company executives announced Monday. ...Although Lockheed’s MQ-25 offering is re-using equipment from legacy airframes, Skunk Works is arguably taken the most risk in its design, putting out a tanker drone concept that doesn’t look much like its competitors. For one, the company ditched its previous design after the Navy ended its program for an surveillance and strike drone and began an effort to develop an unmanned aerial refueling asset, whereas competitors General Atomics and Boeing heavily reused their MQ-25 designs. But perhaps even more noticeably, Lockheed is the only competitor offering a flying wing aircraft after Northrop Grumman dropped out of the competition last year. Both General Atomics and Boeing have notably put forward wing-body-tail aircraft. “We did a number of trade studies,” but found its previous design “was a compromise, as frankly most derivatives end up being,” explained Weiss. The company viewed wing-body-tail configurations as “big, heavy, expensive” and “not as high performing an airplane as we would like,” and returned to a flying wing configuration. Lockheed liked the higher range and low fuel consumption of a flying wing design, Weiss said. Another Lockheed official on the program added that most tankers store fuel in its wings, “but all we are is a wing,” potentially allowing it to carry more fuel...."
"NATIONAL HARBOR, Md. — Boeing’s entrant for the Navy’s MQ-25 tanker drone competition will incorporate technologies from its recently acquired subsidiary Aurora Flight Sciences, the company’s head of its Phantom Works advanced tech and prototyping division confirmed Monday. But Mark Cherry, who was named the vice president Phantom Works in October, isn’t giving up any information about Aurora’s contribution to the program until the Navy awards a contract this summer. “We’re in a competitive situation so we wouldn’t want to tip off our competitors,” he told Defense News in his first interview in his new role. “The ability to leverage Aurora, we do it in ways that make sense in terms of putting us in a good competitive position.” While Cherry gave no hints as to which Aurora technologies could be adopted in MQ-25, the company specializes in a couple key areas. It’s well known as a pioneer of unmanned aircraft like the ultra-long endurance Orion drone, as well as autonomous tech such as robotic copilots. It also manufactures advanced materials and aerostructures and has developed experimental aircraft concepts...."
USN has the NEED FOR SPEED - 2021? ...Ahead of the final selection, the competitors will have to prove a deck handling demonstration for their airframes as part of the ongoing risk-reduction contracts. While the companies are vying for the airframe, the Navy is responsible for designing and developing the data links and the ground control station and acting as the lead systems integrator for the effort. Much of that work was part of the Navy’s X-47B carrier launch and recovery tests in 2013 and 2014. Moving ahead, the real challenge isn’t launching a UAV on and off the carrier but how the aircraft will fit into the airwing and the strike group. “What’s the breakthrough that’s going to occur with the MQ-25? It’s not frankly the ability to operate an unmanned air system off a carrier. We know how to do that,” outgoing Skunk Works head Rob Weiss told reporters on Monday. 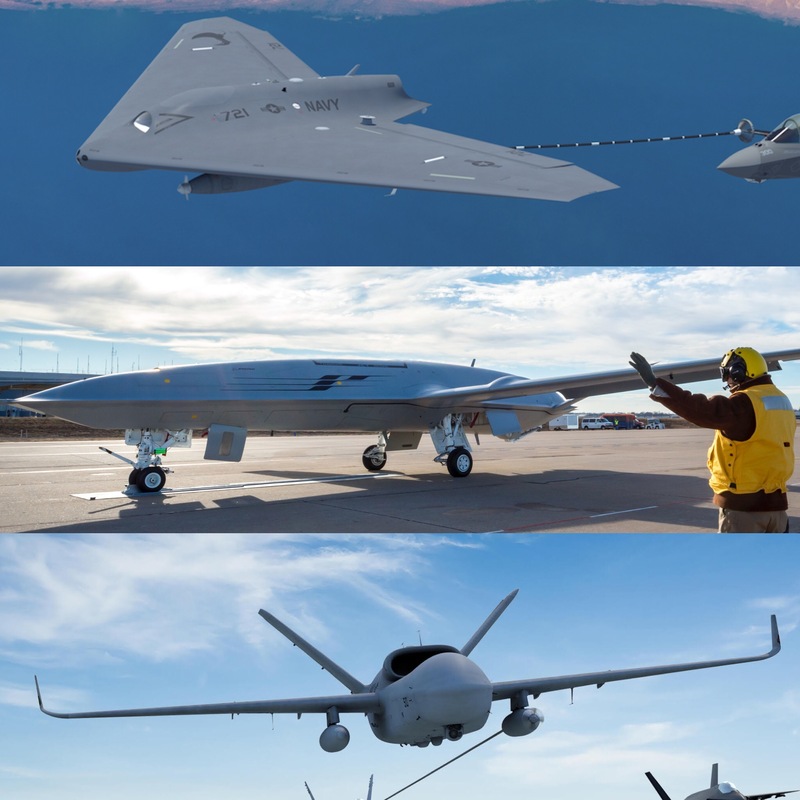 “The learning opportunity is going to be manned, unmanned teaming.”"
"New details of Lockheed Martin’s bid for the MQ-25 Stingray contract reveal a flying wing unmanned tanker with several key components re-used from aircraft already on board the US Navy’s aircraft carriers. The flying wing MQ-25 in Lockheed’s bid will be powered by the GE Aviation F404 engine and supported by United Technologies Aerospace Systems landing gear, says Rob Weiss, vice-president of Lockheed’s Skunk Works division. The F404 engine is now used by the Boeing F/A-18C/D Hornet and a more powerful variant, called the F414, is installed on the series of F/A-18E/F Super Hornets and EA-18G Growlers. More electronic components from the F-35C are embedded in Lockheed’s MQ-25 configuration, but the company declined to specify the hardware. Lockheed considers the use of familiar systems a competitive advantage as the USN evaluates three competing bids, including submittals from Boeing and General Atomics Aeronautic Systems. The aircraft carrier has limited room to store additional spares and personnel as it introduces the unmanned MQ-25 on carriers in the mid-2020s. By leveraging systems and structural components already in the ship’s inventory, the USN avoids the cost of duplicating inventory and training to store and manage spares. The new details about Lockheed’s bid also reveal a strange disparity in thrust ratings offered by two of the three bidders. Lockheed’s F404-powered engine offers about 10,000lb-thurst, according to GE. That’s slightly more than the Boeing’s bid, which is powered by a 9,000lb-thrust version of the Rolls-Royce AE3007. Both Lockheed’s and Boeing’s bids, however, offer a fraction of the thrust of the bid proposed by GA-ASI. The latter’s MQ-25 is powered by Pratt & Whitney Canada PW815 turbofan, which is rated at 16,000lb-thrust." Basic detail about GE 404 engine use incorrect. Author should stick to ships methinks. But hey NO ONE pays me. "...The Lockheed single-engine flying wing proposal features two under-wing hard points for mounting an aerial refueling hose-and-reel pod and an external fuel tank. Sensors are mounted in the nose, one apparently a camera for a carrier crewman to use to taxi the aircraft on the flight deck. There appears to be a satellite antenna fairing behind the nose. A video of the concept shown during the briefing shows two spoilers atop the wing, one on each side. Weiss said the Skunk Works did a lot of trade studies, including leveraging the work it did for the Navy’s previous carrier UAS program, the UCLASS (Unmanned Carrier-Launched Air Strike Surveillance) system. The company deciding that modifying its plan for UCLASS was not optimum. “Frankly, we were not satisfied with that configuration,” Weiss said, “so we started with a clean sheet.” Skunk Works decided on a “high level of reuse on this airplane,” including some avionics, but most notably the landing gear and the engine. The GE Engines F404 — the proven engine used on the Navy’s F/A-1E/F Super Hornet strike fighter [rong] — was selected, which also would simplify engine logistics. The landing gear — built by United Technologies Aerospace Systems — is that same as that used on the Lockheed Martin F-35C Lightning II strike fighter. Weiss said the flying wing design avoids the weight of a tail and fuselage and enables the wing to carry more fuel. He said there is no requirement for the aircraft to be stealthily low-observable but pointed out that the flying wing is a planform that “would lend itself to a low-observable design” should Navy go in that direction. Weiss said the Skunk Works design would be able to operate at “altitudes and speeds that are commensurate with the strike assets.”"
Sounds to me AS IF you could pitch your ideas to whomever. Seeing as the Hornet is going to be gone soon off of CVNs then I don't see an advantage at all, sparewise on the enterprise. Seems to me the GE 414 is a better option - but WDIK? steve2267 wrote: LM Skunk Works has a long history with some drones that do not exist, and probably more we've never heard about that surely never did, do not, nor will ever exist. Two good examples of similar vehicles from LMSW are the recently revealed X-44A and the Polecat demonstrator. steve2267 wrote: Boing UAV's? I'm scratching my head. Boeing was heavily involved in the early J-UCAS program with the X-45. Another example UAS from Phantom Works is the "Phantom Ray" demonstrator. At that point you might as well make a new airplane. spazsinbad wrote: Seeing as the Hornet is going to be gone soon off of CVNs then I don't see an advantage at all, sparewise on the enterprise. Seems to me the GE 414 is a better option - but WDIK? I probably would have gone with the F414 since the Rhinos are going to be on decks a lot longer. There still might be some argument in favor of the F404 versus the other engines though, as the LMSW concept would allow the use of an existing logistical pipeline (F404 would move from classic Hornet to MQ-25) whereas the Boeing and GA-ASI designs would require more work to set that up. Oh good catch -- I had forgotten about those two. Still, the ASI Predators and Reapers have been in operational use for quite a long time. LM also appears to have fairly long experience producing (classified) UAVs that have seen a lot of (apparent) operational use. The Boing UAVs were "just" development programs, correct? So Boing's UAV experience would still seem to trail the other two companies. Maybe. I guess I should have looked for a better tongue-in=cheek avatar than the glyph. I would hope one of those stellar avpress reporters like Sellig should be able to squeeze a story out as to why LM specified the F404 rather than the F414. In fact she should be able to squeeze it for 3-4 stories. Probably. The F414 appears to have pretty close to, if not exactly the same, OML as the F404. With only about a 163lb weight increase but with an extra 2000lb dry thrust, it does seem at first glance to be a head scratcher why LM went with the older motor. But they are the ones adding up the dollars and performing the trades, so there must have been some decent reasons. Last edited by steve2267 on 11 Apr 2018, 01:50, edited 1 time in total. steve2267 wrote: I guess I should have looked for a better tongue-in=cheek avatar than the glyph. Ah, long day so I missed that completely.